New Jax Witty: Everbank (Sorry, TIAA) Ticket Office? Everbank (Sorry, TIAA) Ticket Office? When it comes to tickets for events, I like the face-to-face interaction of going to a ticket office. I only use Ticketmaster when no other options exist. I worked very hard to find out if Everbank Field has a manned ticket office, but I can't figure it out. On top of that, there's no good way to contact anyone. 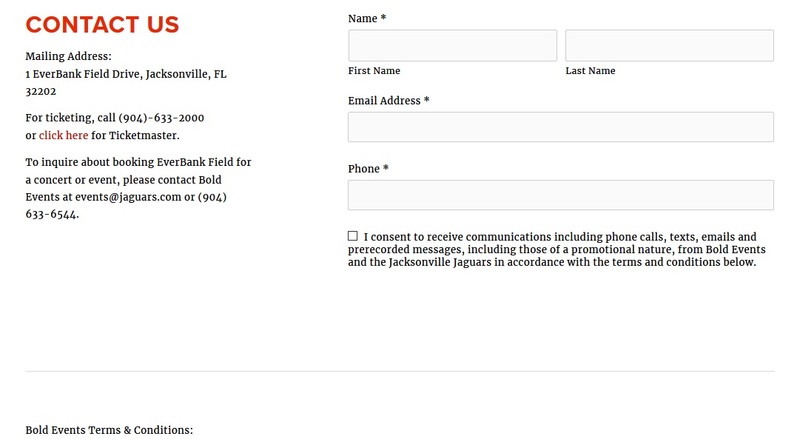 I'm not looking for Jaguars tickets, and that seems to be the only purpose of the Everbank website. But there are other events at the field in the off-season, and that's what I'm interested in. I wanted to take my daughter to a USA Women's Soccer game, but Ticketmaster links were all I could find. I searched up and down the Everbank website for any mention of non-football ticket sales at some sort of a ticket office, but I had no luck. To me, this means tickets are not sold at the field, meaning I am forced to pay Ticketmaster's convenience fee, either ordering online or on the phone to India. I kind of like it when a real sales rep tells me where I might want to sit for a game. 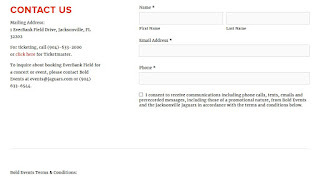 Everbank Field's website does have a contact page, but it just wants my contact info (photo above). It needs my email and phone number, along with me agreeing to get marketing crap from them, without any kind of form to fill out to actually ask a question. I also find it interesting that when one searches for Everbank Field on Google, there's a paid link to Everbank (the actual bank) on top, and the "Website" link goes to the Jaguars home page. Just wondering if the Jaguars actually own the field. Oh, and now I see it's going to be TIAA Bank field because Everbank tanked. When I looked into ownership of the field, it appears it's still the city. Based on Wikipedia's article, it looks like we've spent $121 million to renovate the Gator Bowl, $47 million to host the Superbowl, $43 million of the $63 million 2013 renovation, and an unknown percentage of the $90 million 2016 improvements. So that's about $300 million since the mid 1990s. That's a decent amount of government cheese, so I hope it's a nice stadium when I get there. Anyhow, if anyone has a presale code you want to share, feel free. I guess some of us are better than others when it comes to tickets to events. Probably people who have donated to USA Soccer or something. It keeps telling me "Offer Code Required!" I've tried all the codes I think it might be based on local businesses or whatnot, but I'm not that great as guessing.